You are driving your car, and suddenly from nowhere, your check engine light is flashing on your dashboard. What to do now? Will my car get damaged if I keep driving it?, How much will it cost? There are a lot of questions that are flowing through your brain. But don’t worry. I work as a car diagnostic technician, and in this article, I will learn you what the check engine light is and how to fix it the fastest and cheapest way. When the engine light is flashing, it means that there is a problem with the engine and there is a trouble code stored in your engine control module. Most often the engine light is not flashing, but when the engine light is flashing, it means that the problem with the engine occurs right now at the moment and it’s a more serious problem like a misfire. The Engine control unit is all the time receiving values from all the sensors of the car engine. When it gets all the information, it calculated how much fuel it should inject into the engine and at which angle it should fire the ignition. If one of the values from a sensor is faulty for a short amount of time, it will trigger a trouble code. If the engine control unit is getting the wrong value from the sensor all the time, the check engine light will be flashing until it gets the correct value again. The check engine light is most likely to blink if it’s a severe constant problem, like an occurring ignition misfire, injector or a temperature sensor problem, that have an essential part of the engines running. In rare cases, there could also be an internal engine problem or a faulty engine control unit. From experience, a flashing check engine light is most often a misfire, EGR or an exhaust temperature sensor. Is it safe to drive with the check engine light flashing? It’s never recommended to drive with a flashing check engine light. A constant check engine light can be okay to drive with sometimes, but flashing engine light is most likely a more serious problem that has to be fixed as soon as possible. If you notice the check engine light flashing when you are out and driving, you should drive the shortest way to a mechanic workshop to let them take a look before you keep driving. Driving with a flashing engine light can result in more expensive problems with your engine. One example is if the car is misfiring/not running at all on one cylinder, and you keep driving for a long distance, you can either fill up the catalytic converter with fuel and destroy it. Because the fuel on that cylinder won’t get ignited, the fuel can run down through the piston rings into your oil pan, and it can result in a whole new engine if unlucky. 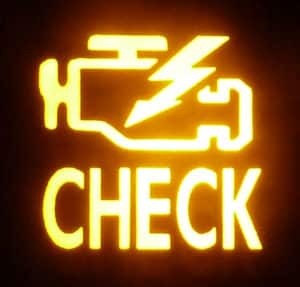 My recommendation: Do not run your car with a flashing check engine light, tow it to the closest workshop if possible. How to find the problem with my flashing check engine light? The first thing you should do if the check engine light is flashing or is constant on your dashboard is to read the trouble code memory. When the engine light is showing up, and the engine control unit recognizes a problem with the engine, the engine control unit will store a trouble code in the memory. The code will be stored there for a long time, so you have the chance to read the trouble codes. But remember that the engine control unit can erase the code itself after a while if it finds the problem fixed, so don’t wait for too long to read the codes. To read the trouble codes from the engine control unit, you need an OBD2 scanner. You can either drive your car to a workshop and let a mechanic read the trouble codes from the engine control unit. You can also do it yourself if you have a scanner. If you do not have a scanner but are interested in getting one, I can recommend the NexPeak T501 that you see in the picture. You have a lot more functions than reading the trouble codes with it, and you can do the most advanced troubleshooting on your engine with it. A flashing check engine light means that the problem occurs at the moment and it’s most likely a more serious problem like a misfire. It’s not recommended to drive with the check engine light flashing or ON. 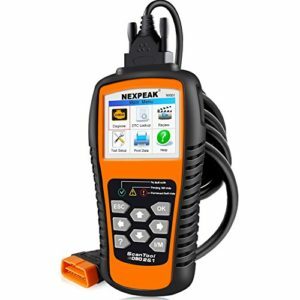 When the problem occurs, the best way is to check the trouble codes with an OBD2 scanner. You can do it yourself at home with a scanner. If you have any other questions about a flashing check engine light or want to share your story of how you fixed it, comment down below. If you have any other car questions, you are welcome to ask them at our homepage. I have a 2005 Subaru legacy SOHC 2.5L engine that went bad. I was told by the store selling me an engine that I could put a 2.0 SOHC in and it would fit and work perfect. I replaced the motor and the 2.0 fit perfectly! Now the bad. However my check engine light is flashing! I took it to my auto pros (a different shop) and they put a factory obd machine on it and said they were stumped as there are NO OBD codes! They said the car runs fine as they checked it out. However no OBD Codes. A BIG, HELLLP! Any feedback Master of the Mechani internet Universe? Either the instrument is not working together with the engine control unit if you replaced it, or there are stored trouble codes but the code scanner could not read these. In our country the rain made lakes in all our roads so i drived in some water lakes on certain road and the water was minimum 50cm high and it entered my car honda accord model 1988 and when i reached my home it suddenly turned off and would turned on again because the check engine is blinking and there is other devices next to the engine are blinking noise sound. So what shall i do? You should absolutely read the trouble codes with a scanner and see what it says. Most likely you can erase the codes and keep driving as there was maybe bad connection in the wirings caused by the water. My engine light was on my 4 cylinder 2001 Honda CRV. I took it to Goodyear and they scanned at and said there were misfires on cylinders 2, 3 and 4. The car was driving fine though (4 hour drive on the way to the shop). They replaced spark plugs and wiring and then the engine light began flashing. They scanned it again and it’s saying there’s random misfiring now. I had to drive it home from Charlotte, NC to Atlanta, GA and now problems with the car or engine temp… Any recommendations on what to do next? Random misfires are often caused by a faulty fuel mixture. Common things for a lean mixture is an intake leak/PCV valve problems. It can also be caused by low fuel pressure in the pressure rail. However, I would begin with checking for intake leaks and make sure that the PCV valve is in good condition. I have an 02 Dodge Durango 4.7 L , it has recently popped a code PO302. Cyclinder 2 misfire. I have replaced the ignition coil module on cyclinder 2 & the throttle position sensor. However, after 3 – 4 days of driving it reappears again. What else could it be? @Van Did you check the spark plugs on the affected cylinder? It could also be a wiring problem or a faulty injector (not very common though). I would check and replace the spark plug if you haven’t!